Researchers at NJIT's Big Bear Solar Observatory (BBSO) in Big Bear, CA have obtained new and remarkably detailed photos of the Sun with the New Solar Telescope (NST). 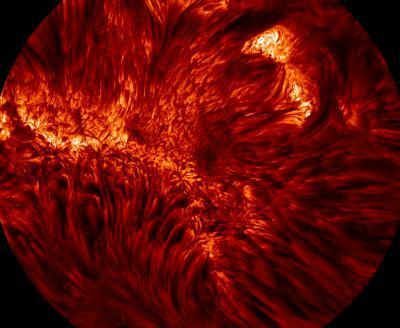 The photographs reveal never-before-seen details of solar magnetism revealed in photospheric and chromospheric features. "With our new generation visible imaging spectrometer (VIS)," said Wenda Cao, NJIT Associate Professor of Physics and BBSO Associate Director, "the solar atmosphere from the photosphere to the chromosphere, can be monitored in a near real time. One image was taken with VIS on May 22, 2013 in H-alpha line center. The lawn-shaped pattern illustrates ultrafine magnetic loops rooted in the photosphere below." The other photospheric photograph is the most precise sunspot image ever taken: A textbook sunspot that looks like a daisy with many petals. The dark core of the spot is the umbra and the petals are the penumbra. "With the unprecedented resolution of BBSO's NST, many previously unknown small-scale sunspot features can now be perceived," said Cao. In particular, there are the twisting flows along the penumbra's less dark filaments, the complicated dynamic motion in the light bridge vertically spanning the umbra's darkest part and the dark cores of the small bright points or umbra dots. BBSO has been under NJIT's management since 1997 when NJIT took over the facility from California Institute of Technology. The founder and executive director has been NJIT Distinguished Professor Philip R. Goode, a Fellow of the American Physical Society and the American Association for the Advancement of Science and the American Geophysical Union. Goode led the project, which was completed in 2009, to build the world's most capable solar telescope at BBSO. The new1.6 meter clear aperture, off-axis instrument is the world's largest solar aperture telescope. 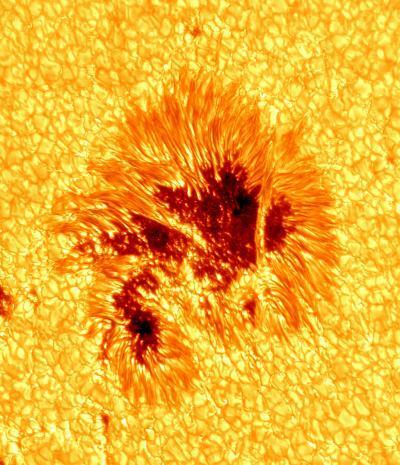 The most precise sunspot image ever taken is shown. With the unprecedented resolution of the Big Bear Solar Observatory's New Solar Telescope (NST), many, previously unknown, small-scale features are revealed. They include the twisting flows along the penumbra's less dark filaments, as well as the complicated dynamical motion in the light bridge vertically spanning the darkest part of the umbra, as well as the dark cores of the small bright points (umbra dots) apparent in the umbra. The telescope is currently being upgraded to include the only solar multi-conjugate adaptive optics system to fully correct atmospheric distortion over a wide field of view, as well as the only fully cryogenic solar spectrograph for probing the sun in the near infrared. Other instruments have been brought on-line since 2009, to enable the NST to probe the sun with its full scientific capability for measuring magnetic fields and dynamic events using visible and infrared light. The telescope is currently being upgraded to include the only solar multi-conjugate adaptive optics system with the goal being to fully correct atmospheric distortion over a wide field of view, as well as the only fully cryogenic solar spectrograph for probing the Sun in the near infrared. Other instruments have been brought on-line since 2009, to enable the NST to probe the Sun with its full scientific capability for measuring magnetic fields and dynamic events using visible and infrared light. Cao has been the lead scientist for the development of the NST scientific instrumentation. The NST is the first facility-class solar telescope built in the U.S. in a generation, which was built and operated by BBSO/NJIT. Cao's research interests involve the design, development, implementation, and operation of facility-class astronomical instrumentation performing high-spatial resolution solar spectroscopy and spectropolarimetry to perform solar physics research in visible and infrared light. Cao has successfully led a number of scientific instrument projects for the NST, including leading the installation of VIS, the infrared imaging magnetograph, the broad-band filter imager, the near infrared imaging spectro-polarimeter and upgrading AO-76. Success in these projects has brought unprecedented high-resolution data, which are now online and have enabled cutting-edge research. He is also co-PI on the AO-308, the cryogenic infrared spectrograph and the multi-conjugate adaptive optics projects. Cao is the recipient of an NSF Early Career Development Award, which has allowed him and his research group to further explore the techniques of magnetic field measurement of the photosphere and chromospheres employing the infrared spectral lines. The hope is to eventually uncover the mystery of solar coronal heating. In recent years, industry, government and scientists have begun placing increasing attention upon space weather to learn more about which solar magnetic storms can have deleterious effects on satellites, the terrestrial power grid and telecommunications. This image was taken with the visible imaging spectrometer on May 22, 2013, in H-alpha line center by the New Solar Telescope (NST) at Big Bear Solar Observatory (BBSO), Calif. The lawn-shaped pattern shows ultrafine magnetic loops rooted on the photosphere. The telescope is currently being upgraded to include the only solar multi-conjugate adaptive optics system to correct atmospheric distortion over a wide field of view, as well as the only fully cryogenic solar spectrograph for probing the sun in the near infrared. Other instruments have been brought on-line since 2009, to enable the NST to probe the sun with its full scientific capabilities for measuring magnetic fields and dynamic events using visible and infrared light.